For so long, I’ve watched from the sidelines and devoured the recipes of others taking part in various food blogging events. Now that I’ve taken the plunge and my own nascent blog is nearly a week old, am I really entitled – or even qualified – to participate in these?? I certainly didn’t feel either ready or capable of doing so … until, that is, I read about the latest theme for Sugar High Friday, an international event involving the creation of a favourite dessert based on a different theme each month. This month’s host, Johanna of The Passionate Cook, announced a round-up of local and regional specialities in her choice of theme, Going Local! How could I sit back? Here in Devon we have such a feast of local produce from clotted cream to cider, fresh strawberries and raspberries to Plymouth gin and farmhouse cheeses. The climate and geography combine to create a fertile, productive farmland that is host to an ever-thriving local food culture. As insecure as I may feel about my blogging and baking abilities, I am at least confident to shout loudly about the abundance of local and regional specialities the South West of England has to offer! Perhaps luckily for me (too much choice could have paralyzed me into inaction! ), I’m in the throes of packing for my sister’s wedding this coming weekend and our holiday the week after. Combined with looking after my 3 young children (the eldest of whom currently has chicken pox, just in time to be a spotty bridesmaid) and trying to prepare the house for significant building work next week, I didn’t have a great amount of time to ponder if I wanted to catch the deadline of Monday, 27 August. 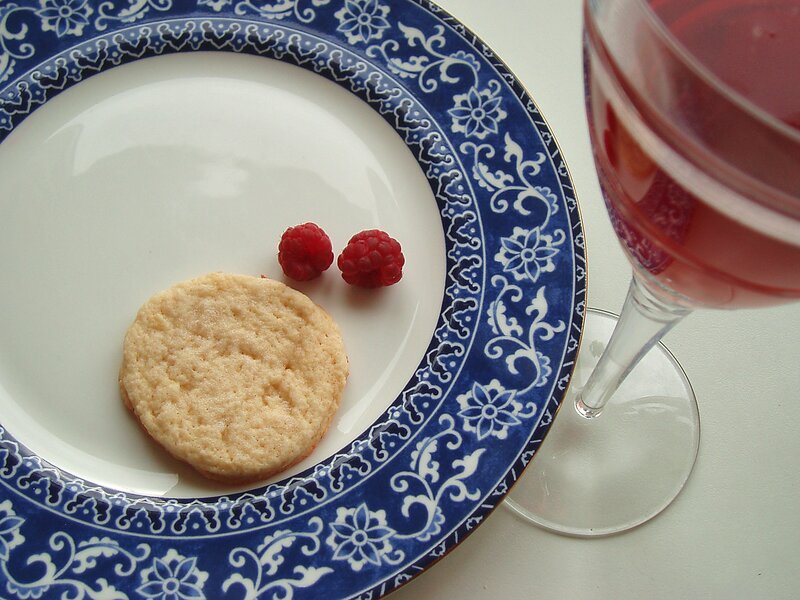 I decided therefore to keep things simple and to offer a batch of Devon Flats and Raspberries made from fresh, locally-sourced ingredients. Devon Flats are sweet biscuits that put me in mind of afternoon village cricket teas and Women’s Institute stands at church summer fêtes. 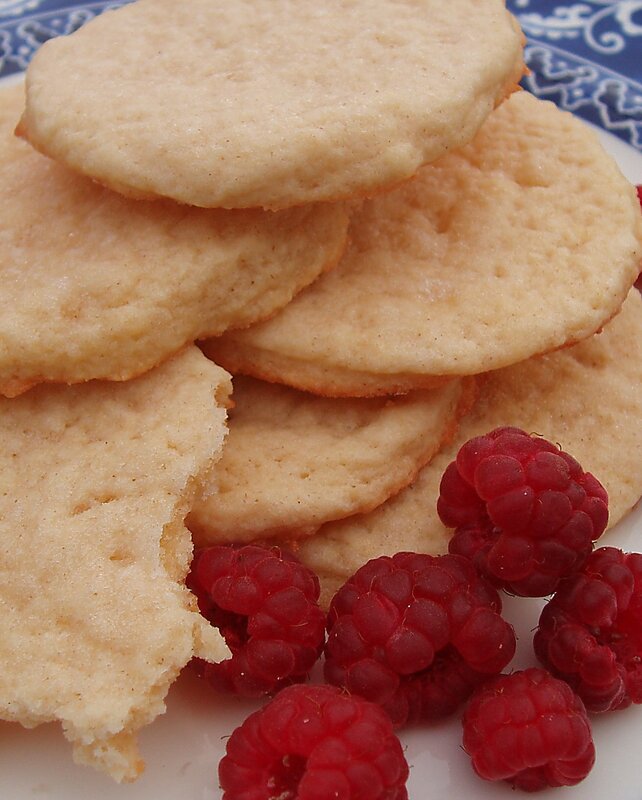 They are made with clotted cream rather than butter and have a delicious, light, creamy taste. This is a true West Country and Devonshire offering with clotted cream and milk from West Hill Farm, flour from FWP Matthews, an egg from my neighbours’ chickens, raspberries grown by John Lake in Ebford (near Topsham) and raspberry lemonade from Luscombe Farm. Rub the cream into the flour with your fingertips. Add the sugar. Beat the egg and stir into the mixture. Add a little milk if necessary to form a soft, smooth dough. 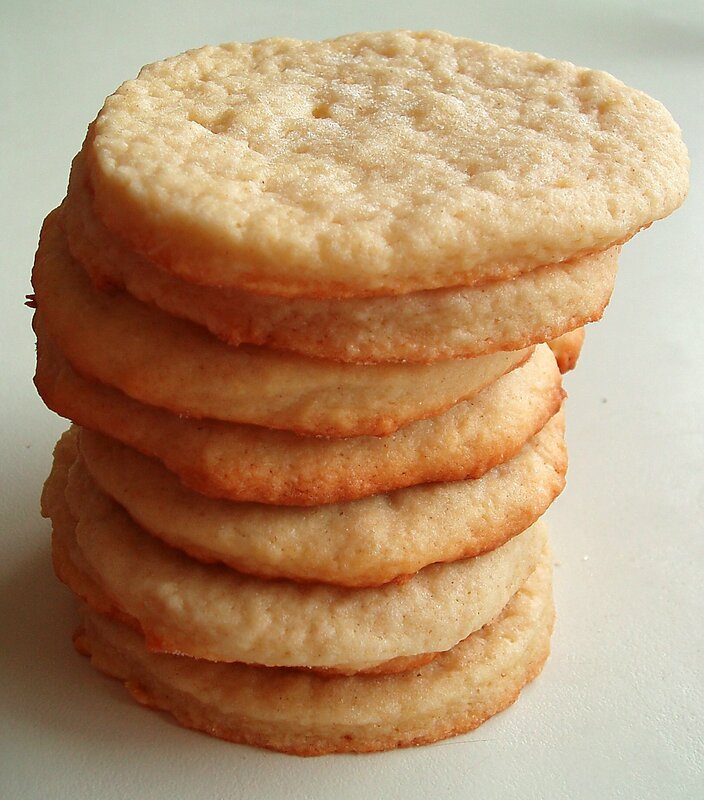 Place on a lightly floured surface and roll out thinly. Cut into 7-8 cm (3″) circles. Place on an ungreased baking tray (this may be easier said than done! I reshaped most of my circles once they were on the baking tray) and sprinkle the tops with a little sugar. Bake at 375 degrees F/190 degrees C for 10 to 15 minutes until the flats are golden. Leave for a couple of minutes to become firm before transferring the flats to a wire rack to cool. welcome to blogging events… and SHF is certainly so much richer for your contribution! I will have to try these, my Mum loves clotted cream and I love biscuits – when she’s coming over in the fall, the raspberry season will be over, but I bet you can just use some home-made jam as well! Thanks for taking part in SHF34! These look delicious. I know exactly how you feel about entering your first blogging event – this was only my second and I felt rather hesitant at first! Glad that you did enter so I could discover another good blog!